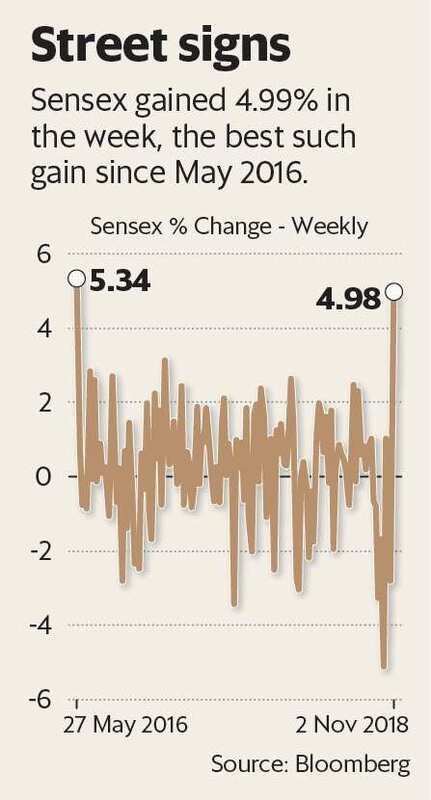 Mumbai: India’s benchmark Sensex rose nearly 5% in the week, logging its best weekly gain in two-and-a-half years, buoyed by a rise in global equities, and positive cues on the domestic front. Global stocks rallied on Friday after US President Donald Trump reported he had a “long and very good" telephone conversation with China’s Xi Jinping, sparking hopes that a deal to end a prolonged trade dispute could be made with China later this month. On Friday, BSE’s 30-share Sensex rose 1.68% or 579.68 points to close at 35,011.65 points, while National Stock Exchange’s 50-share Nifty climbed 1.66% or 172.55 points to close at 10,553 points. The Sensex and Nifty gained 4.99% and 5.21% respectively in the week, their best such gains since May 2016 and March 2016 respectively. However, the smart gains registered by the market on Friday and the week as a whole was not a trend reversal, experts said. “A series of events has led to this recovery but it’s too early to call it a reversal. We’ve seen a decline in crude oil prices and strengthening of the rupee earlier also but only for a short duration," said Jayant Manglik, president, Religare Broking Ltd.
Also buoying sentiment was a US decision to allow eight countries, including India, South Korea and Japan, to keep buying Iranian oil after it reimposes sanctions on Tehran from next week, according to Bloomberg. Brent crude, which last month surged above $86 a barrel for the first time in nearly four years, now trades at a two- month low at $72.81 per barrel. The international benchmark has lost nearly 15.6% in the last one month. The rupee has appreciated 1.36% this week, its biggest weekly gain since March 2017. “Improvement in global sentiment combined with support from earnings is required for sustained recovery, else it will fizzle out in no time," said Manglik. Other seemed to agree. “Sentiment has started turning a bit positive after Trump made a move to seek truce with China. There was also a news report that US has given India waiver to buy Iranian oil," said Deven Choksey, group managing director, KR Choksey Investment Managers Pvt Ltd, adding that the rupee had also appreciated after a long time. “However, the headwinds continue. We have Brexit implementation later this month and upcoming Indian state elections. We also need to read the fine print of the truce with China," said Choksey. All sectoral indices barring BSE IT index and BSE Teck index closed higher on Friday. BSE Auto and BSE Metals indices led the gainers, with 4.05% and 3.04% gains respectively. Financials contributed the most to the gains for Sensex. Mortgage lender Housing Development Finance Corporation Ltd and private lender HDFC Bank Ltd contributed the most to Sensex’s gains. They advanced 3.44% and 1.87% respectively.